The set of waste pyrolysis plant contains two sets of pyrolysis reactor, one set of condenser, one set of de-dusting system. At present, we have completed delivery work. When, customer received the whole pyrolysis plant. We would send our professional engineer to install, debug, and train the worker to operate the machine. 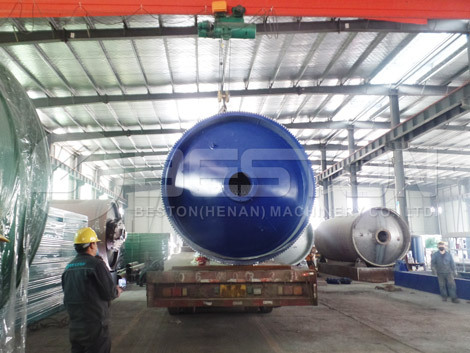 We would help to solve any problems about the tyre pyrolysis plant. The customer is planning to recycle waste tires into fuel oil with Beston pyrolysis plant. The daily capacity of BLJ-10 tyre pyrolysis machine can reach 8-10T. If you need the pyrolysis plant of 6T, 15-20T, 20-24T, contact us now! You will buy the most appropriate plant from Beston Machinery.